Laura, Gary & Maria packing up the donations. 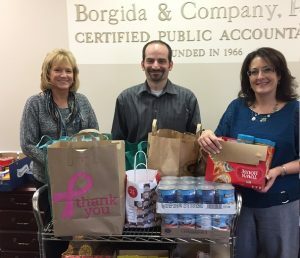 This year’s Borgida & Company Food Drive was another big success. 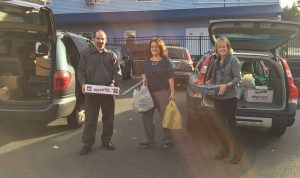 Along with over 1,000 pounds of food donated to M.A.C.C. 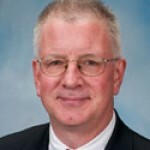 Charities Food Pantry, the firm and its clients donated over $750 in monetary contributions as well. MACC employees shared their appreciation and commented on how great the need was. On the day that we made our delivery, they had stocked up fifty families. 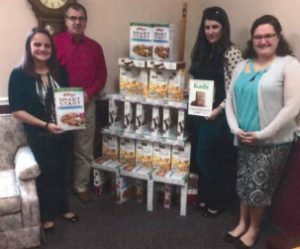 Our clients at Forensic Accounting Services, LLC (http://forensicaccountingservices.com) created a tower of cereal (healthy, organic cereal) in our office. 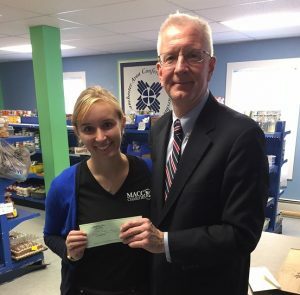 Tom presents MACC Community Engagement Manager Meaghan Sprague with a check.